Home » science » Does tapping a can of fizzy drink really stop it foaming over? When you open a can of fizzy drink, the refreshing “hiss” is the result of gas bubbles escaping from the liquid as a result of a change in the solubility of the carbon dioxide (CO2) in it. This change occurs due to the pressure inside the can decreasing from ~3 bar (can closed) to 1 bar at atmospheric pressure (can open). The solubility of CO2 in water reduces from ~4.5g in one litre (33.8oz) of water at ~3 bar, to ~1.5g at atmospheric pressure, something that is described by Henry’s Law. 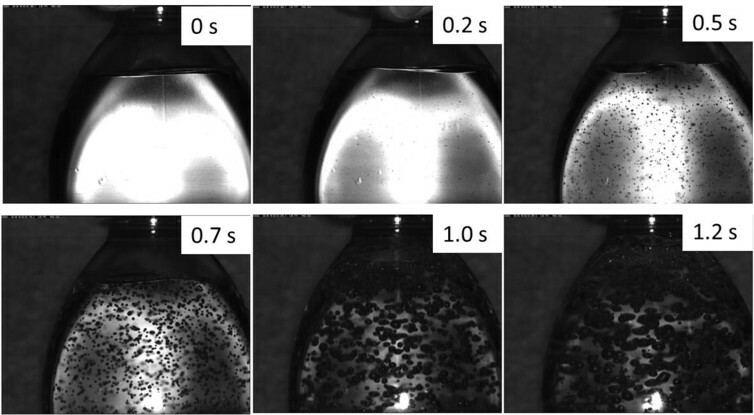 Figure 1: the bubble formation upon opening a bottle of sparkling water. Images captured specifically for this article. 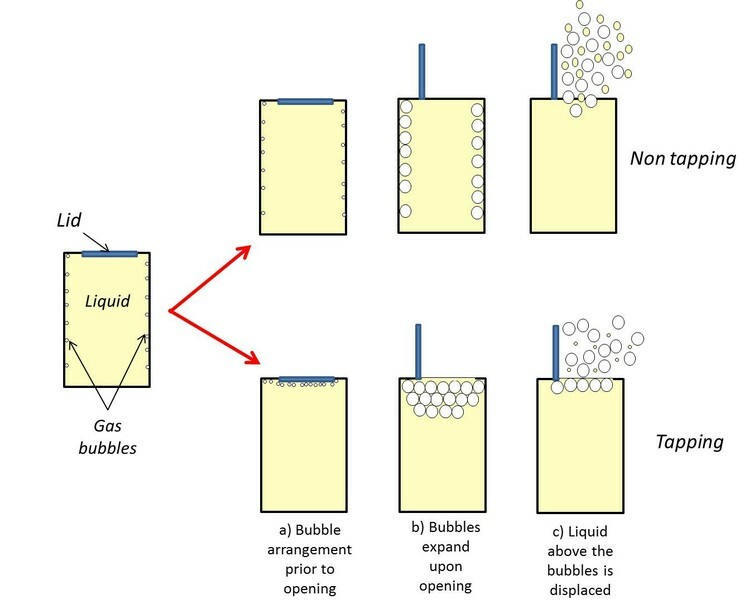 When a can is opened, the bubbles expand (Figure 2b) with those deeper within the liquid traveling further than those near the surface, displacing more of the drink and possibly resulting in greater amounts of ejected liquid. A “tapped” can will have fewer of these “deep” bubbles and so less liquid will be dislodged – and possibly sprayed out – than an “untapped” can (Figure 2c). Figure 2: a possible mechanism for why tapping a can before opening may reduce gushing. Diagram drawn specifically for this article. Another important factor when it comes to the level of gushing is the stabilization of the bubbles caused by the presence of large molecules in the drink. This is why some beers have long-lived foam heads compared to the short-lived bubbles at the surface of, say, sparkling water. But such foam stabilizing agents are a conversation for another day. So why not try different ways of opening your fizzy drink – and see how much of it you end up wearing. Chris Hamlett, Lecturer in Chemistry, Nottingham Trent University. This article was originally published on The Conversation. Read the original article. 06/15/2016. Category: science. Tags: beer, soda, water.